Fumbling with my car radio while driving through foggy predawn darkness, I tune in an overnight news program from the British Broadcasting Company. The host is presenting global headlines, but I’m preoccupied with local concerns: It’s cold, raining, and I’m facing a 26-mile run from Black Mountain to the Blue Ridge Parkway and back in a garbage-bag poncho. I note that this place rightly bills itself as the front porch of Western North Carolina. Nestled near the eastern edge of the Blue Ridge, the picturesque community welcomes westward travelers to the mountains after they crest the Eastern Continental Divide on Interstate 40. But there are more hospitable times of year to visit here than a damp, dark winter morning. Yet facing off with the weather is one of the draws of this marathon, which takes place in conjunction with the more grueling 40-mile Mount Mitchell Challenge. Both courses cover the frozen trails of Pisgah National Forest. Given my unheralded athletic history, I have little business participating in any endurance event, let alone a trail marathon that climbs 2,850 feet in potentially brutal weather conditions. But the rugged landscape of this region has a way of luring people into the wilderness to challenge themselves. Each year, the combined event draws more than 300 runners from across the country. The companion races start simultaneously, heading into Montreat before ascending backcountry trails to the parkway, where marathoners turn around and run downhill to Lake Tomahawk. Mount Mitchell Challenge competitors continue up the mountain’s 6,684-foot summit before descending to the same finish. An off-season spotlight on the historic connection between Mount Mitchell and Black Mountain, the challenge has become a nationally acclaimed endurance event, attracting a host of topflight, sponsored racers. Standing alongside other runners by the Old Depot before the 7 a.m. start, I wonder if I overpacked. I’ve completed this race twice, but never in foul weather. After filling my CamelBak with three liters of Gatorade, plus gloves, a hat, windbreaker, banana, packets of energy chews, and an iPod, I look like a day hiker compared with the elite entrants holding nothing but water bottles. Although it’s raining, temperatures in the 40s aren’t overly imposing. Running generates significant body heat, and many entrants are clad in just shorts and T-shirts. Following the lead of most other participants, I ditch my homemade poncho as the race begins, and take off to the sound of clapping along Cherry Street. About three miles in, the race leaves pavement as it reaches the Rainbow Springs trailhead just past the Montreat College campus. At this stage, the serious racers are long gone, leaving plenty of room for the remaining single-file line of runners headed under a rhododendron canopy. But my light-hearted mood later dims as I pass a shivering, purple-faced runner wrapped in a blanket and being helped down the trail. Once runners cross the ridge into McDowell County they’re fully exposed to a bitter northeast wind. It takes only a few minutes before I stop near a bear hunting cabin to put on my windbreaker and hat. From there, it’s about 10 miles up the old toll road to the Blue Ridge Parkway. Once used to bring tourists to Mount Mitchell, the double-track “road” is a combination of slippery rocks and soupy mud. Soaked and growing colder, I pick my way up the path’s rocky center to avoid the worst footing. The rain has saturated my gloves, so I stuff them in my pack and clutch the ends of my windbreaker sleeves in a vain attempt to protect my fingers. To distract me from the pain, I turn up the volume on my iPod. 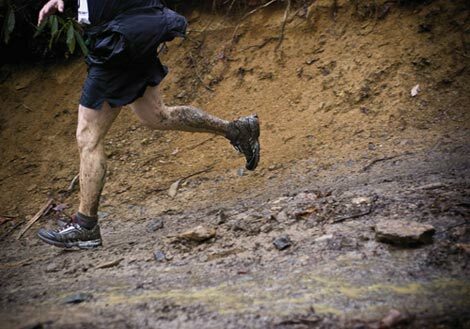 Running purists, as well as those with more common sense, would deem music on the trail a hazardous distraction. But at this point, the adrenaline-spiking riffs of Keith Richards and the Rolling Stones provide crucial motivation. Marathon experts would also recommend plenty more training than the half-dozen five- to 10-mile runs I’ve undertaken, which manage to keep me in just enough shape to run 26 miles. Thankfully, trail events also tend to be easier on my knees than pavement pounding marathons. As I trudge on, the sight of other marathon runners heading down the trail long before I reach the parkway turn is an inspiring display of fitness. I’m eventually passed by competitors in the Mount Mitchell Challenge, who have already run about 14 more miles than me, including up and down the highest peak east of the Rockies. On this day, the weather gives 40-milers all the challenge they want, as 60 mile-per-hour winds and a brutal mix of sleet and snow buffet runners at the summit. Snow is mercifully not falling on the parkway, which is enveloped in soggy, spine-chilling gloom, burying the soaring skyline of nearby peaks. Fortunately, the aid station at the turn is equipped with a portable heater, which helps return feeling to my fingers. Volunteers from fire stations and local businesses staff multiple aid stations along the course, stocking them with liquids, fruit, nuts, chips, and more. Some of the volunteers even camp along the route to provide assistance. Heading down the trail, I stop for fuel at each station, but decide not to stay long for fear of freezing in place. Rounding Lake Tomahawk, I finally cross the finish line at about 1 p.m., six hours after the start. Huddled near another electric heater, I wonder why I’ve returned to this event for the third year. Ultimately, the camaraderie, compelling terrain, and simple joy of finishing make the event something special, despite the annual dose of pain. Rubbing my numb toes, I realize that this February I’ll once again be up before dawn, gathering my gear for another run. The 13th Black Mountain Marathon and Mount Mitchell Challenge start at 7 a.m., February 27. The races are already sold out, but spectators will gather at the Old Depot in Black Mountain for the start, along the road to Montreat, at Sourwood Gap, and the summit of Mount Mitchell via N.C. Route 80, weather permitting. Registration for the 2011 races opens Sept. 1.